By the same token, ultrasound has not only been a valuable medical tool but also a powerful storytelling tool. Today, it is often put to use four or more times before a patient’s due date. While the FDA and other authorities advise against ultrasounds that aren’t medically necessary — recommending just two for a low-risk pregnancy — many patients opt for additional, elective ultrasounds for the sake of having keepsake images. Posting those images online has become a popular way to share their news with family and friends. Recognizing that storytelling quality, abortion opponents have latched onto ultrasound as a tool to roll back reproductive rights, hoping that by forcing women to view their fetal images, they can steer them away from abortion. As a brief look at its history makes clear, the medical uses and political misuses of ultrasound have both been abundant. The study of ultrasound dates back to 1794, when the Italian physiologist Lazzaro Spallanzani demonstrated how bats use high-frequency sound echoes to navigate their flight. Over the next two centuries, other discoveries helped pave the way for the medical use of ultrasound, including Christian Doppler’s 1842 discovery of the Doppler effect and Pierre Curie’s 1880 discovery of the piezoelectric effect. Over time, those two discoveries led to the development of devices that could emit and receive high-frequency sound waves and read them electronically. The practical application of ultrasound took off during World War I, when Paul Langevin, one of Pierre and Marie Curie’s pupils, developed hydrophones to help French ships detect German submarines. By the middle of the 20th century, scientists learned they could also use ultrasound to create two-dimensional images of the objects they targeted — including human tissues. The first medical uses of ultrasound included the detection of brain tumors and gallstones. However, the earliest attempts at medical ultrasound involved cumbersome setups that submerged or surrounded the patient with water, typically in a bath tank. Ian Donald, a researcher at the Glasgow Maternity Hospital in Scotland, would help change that. Donald was a veteran of the British Royal Air Force who had used Langevin’s World War I-era technology to locate German submarines during the second World War. Donald collaborated with another doctor, John MacVicar, and an engineer, Thomas Brown, to perfect the use of ultrasound for medical diagnostics. Eventually they developed a “flaw detector” that helped doctors locate tissue abnormalities — all while replacing the water-bath setup of earlier prototypes with a gel that could be applied to the patient’s body. Their invention helped diagnose an ovarian cyst in one of their first test patients. With other patients, Donald, who was an obstetrician by training, was able to identify twins, triplets, and fetal anomalies. Donald and his colleagues shared their findings in an article titled “Investigation of Abdominal Masses by Pulsed Ultrasound,” which appeared in the June 7, 1958, issue of The Lancet. They entered medical history as the first scientists to publish fetal ultrasound images. Although Donald and his colleagues made a significant medical breakthrough with their landmark Lancet article, obstetric and other medical uses of ultrasound would take several years to gain momentum. Advancements like improved materials, more sophisticated electronics, and the development of microchips made the widespread use of ultrasound possible. After years of incremental progress, ultrasound took a big leap forward in the 1970s, thanks to a Phoenix-area inventor named Martin Wilcox. An electrical engineer by training, Wilcox began working with medical equipment early in his career, first at a hospital and later at two electronics companies. In 1972, he co-founded his own company in Tempe, Advanced Diagnostic Research Corporation (ADR), where he developed an ultrasound scanner that dramatically improved image quality, portability, and maneuverability — and in many ways set the standard for the ultrasound machines used today. While prior devices only allowed for static images, ADR devices could produce “real-time” or live images. With these technical advances, ultrasound was now an invaluable tool for obstetricians. In addition to enabling the confirmation of normal pregnancies, ultrasound became indispensable in screening for many pregnancy complications and embryonic or fetal anomalies, such as preeclampsia (abnormal maternal blood pressure), ectopic pregnancy (an embryo outside the uterus), renal agenesis (a condition affecting kidney development), and microcephaly and anencephaly (conditions affecting brain and skull development). In a history of obstetric ultrasound he wrote for a reproductive health journal, Stuart Campbell of London University described Ian Donald as “a most generous and principled man whose anti-abortion stance denied him honours in his own county.” Donald, who was the lead author on the landmark Lancet paper on ultrasound, was also a resolute High Anglican who felt that fetal imagery could have a profound effect on women who were considering abortion. 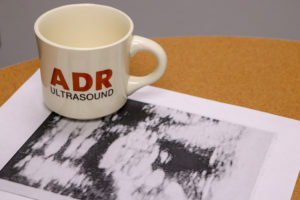 Years later, the great leap forward that Martin Wilcox and ADR brought to ultrasound technology would coincide with the ramping up of the abortion debate, when Roe v. Wade went before the Supreme Court in 1973. As the real-time ultrasound that Wilcox pioneered became a staple in prenatal care, abortion opponents embraced the technology, believing that women who saw the fetuses they were carrying would immediately be horrified by the idea of abortion. This idea gained traction in 1983 with the publication of an article in the New England Journal of Medicine titled “Maternal Bonding in Early Fetal Ultrasound Examinations.” In the article, Drs. John C. Fletcher and Mark I. Evans published accounts of women who had decided against having abortions after seeing their ultrasounds. By the mid-1990s, many states were putting the idea into legislation, passing bills that forced doctors to show — or at least offer to show — ultrasound images to women who were seeking abortions. According to the Guttmacher Institute, more than half of all U.S. states now impose some form of ultrasound requirement on abortion providers. Arizona is among those states. While abortion opponents have put a great deal of faith in ultrasound requirements, anecdotes like those published by Fletcher and Evans are by and large the only support they have for the claimed effect of ultrasound imagery. Small studies in Canada and South Africa, as well as a very large study of more than 15,000 medical records from Los Angeles, have confirmed that viewing fetal ultrasounds lacks any significant persuasive power to deter abortion. 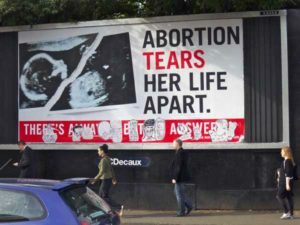 In the LA study, which examined records from an urban abortion provider, 42.5 percent of patients opted to see their ultrasounds, and out of those patients, 98.4 percent followed through with their abortions as planned. The LA study was published in the January 2014 issue of Obstetrics & Gynecology. Since its publication, however, forced ultrasound bills have been proposed or introduced in numerous state legislatures, including South Carolina, Colorado, Utah, and Missouri. The persistence of these bills suggests that the legislators behind them have no interest in letting reproductive rights or empirical evidence guide health policy — and that they view lawmaking as little more than an opportunity for cheap moral posturing. Ultrasound is a powerful tool, with a long history in the care of patients who are on their journey to parenthood. Used by health professionals for the benefit of patients, ultrasound can enable healthy pregnancies and parental joy. But when used as a cudgel by abortion opponents, ultrasound is a reminder to women that their bodies are viewed as political battlegrounds, over which they have limited decision-making powers. State-mandated ultrasounds don’t uncover medically necessary information. Instead, they point to legislatures that have abandoned science for ideology. This entry was posted in Abortion, History and tagged abdominal masses, abortion, ADR, Advanced Diagnostic Research Corporation, anencephaly, Arizona, bats, blood pressure, brain, brain tumors, British, Britons, Canada, Christian Doppler, Colorado, computer, cystic, Doppler effect, due date, ectopic pregnancy, embryo, FDA, fetal anomalies, fetus, flaw detector, French, gallstones, German, Glasgow Maternity Hospital, Guttmacher Institute, health policy, High Anglican, hydrophone, Ian Donald, Italian, John C. Fletcher, John MacVicar, kidney, LA, Lazzaro Spallanzani, London University, Los Angeles, Marie Curie, Mark I. Evans, Martin Wilcox, maternal bonding, microcephaly, Missouri, New England Journal of Medicine, Obstetrics & Gynecology, ovarian cyst, Paul Langevin, Phoenix, Pierre Curie, piezoelectric effect, preeclampsia, pregnancy, prenatal care, real-time, renal agenesis, reproductive health, reproductive rights, Roe v. Wade, Royal Air Force, Scotland, skull, sound waves, South Africa, South Carolina, Stuart Campbell, submarine, Supreme Court, Tempe, The Lancet, Thomas Brown, triplets, twins, ultrasound, Utah, uterus, World War I, World War II by Matt. Bookmark the permalink.